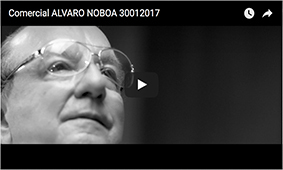 El Comercio newspaper published a note about businessman Alvaro Noboa, in which he states “he came forward before the ‘Swiss Leaks’ denounces,” referring to the press conference he gave this Monday, February 9, 2015. The content explains that Mr. Noboa made it clear he, personally, has not or haven´t had any account at HSBC. Much of the press conference given by Mr. Noboa in his office in the city of Guayaquil, where he assured the reporters that the Noboa Group businesses fulfill their tax and duty obligations to the tax authorities, was cited. Furthermore, the newspaper cited that “it is an investigation of a group of friends. There is no authority involved, nor of Ecuador or Europe, or anywhere in the world,” in the the words of businessman Noboa. The newspaper also mentioned that at company level, Alvaro Noboa has many invitations from all over the world to do businesses, it even mentioned a meeting with the former Cuban leader Fidel Castro. “I spoke with him in New York. He called me and invited me and a group of businessmen from around the world, in the home of a friend of mine, to invest in his country. Then do not be surprised that Fidel Castro invites me to invest in his country. In the same way,businessmen who want to do business with me invite from Europe, Asia and the US,” said the Alvaro Noboa, cited by El Comercio. The text concludes in the interest of the businessman Noboa to invest in a country like Cuba, provided they overcome their international problems.